Welcome to Tronster.net: What the heck is wrong with the Senate? What the heck is wrong with the Senate? 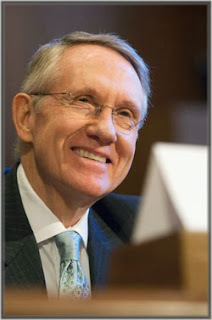 Used without permission from Harry Reid's website. Okay Senator, what exactly are you thinking? Are you sure this is how you want to handle appointments? It seems that the Senate is too busy to pass a National Budget, however, you are capable of changing the Senate rules to stop the filibuster in the case of presidential appointments. I think you will hear from some folks about your tomfoolery in the Senate. The founders envisioned the Senate to represent the state governments in the Congress. Well, since the direct election of the Senators, the Senate has failed its mission. It no longer protects the rights of the states. When FDR tried to expand the Supreme Court, the Democrats stood up to him, because it was not a bad idea. The sham you are pulling is also a bad Idea, and I personally think you are going to hear a lot about this decision very soon.